Due to their trade value, a huge range of artistic materials is documented and recorded in historical written sources, such as guild regulations, contracts between artists and patrons or pharmacy price lists. However, certain substances are not recorded in these types of archives because they did not have market value. This is notably the case for plant-based materials that artists could easily find in nature and use for their colouring properties, such as the anthocyanin colourants. As these colourants are highly unstable in ordinary daylight, it was generally thought that they were not used in the dyeing of quality materials or to make paint but rather employed in a domestic context, as dyes for everyday clothes. To complicate the issue, anthocyanin colourants are difficult to identify through currently available analytical methods. For all these reasons, these substances have long remained ‘elusive’. Nevertheless, research on mediaeval artists’ recipe collections has highlighted that a number of these books not only describe these organic colourants, but also indicate their use in illumination. Based on a corpus of more than 400 mediaeval artists’ recipe books, this project intends to analyse the significance of these organic substances and to (re)define their use in an artistic context. In order to find citations of anthocyanin colourants throughout a vast amount of recipes, a specific database of artistic recipes was used (‘Colour ConText Database’). This database enables easy identification of recipes dedicated to anthocyanin colourants and allows researchers to deduce the availability of these colourants in a chronologically and geographically defined area. The database also makes it possible to establish and compare the different ways in which these colourants were prepared. Thanks to this tool, I have found that the use of anthocyanin colourants is particularly frequent in the artists’ recipe books of the so-called ‘Strasbourg tradition’. Within this group, the recipes describe the use of corn poppies (Papaver rhoeas L.), blue cornflowers (Centaurea cyanus L.) bilberries (Vaccinium myrtillus L.), and elderberries (Sambucus sp.) for producing colours. Papaver Rhoeas L. & Centaurea Cyanus L.
From these sources, it becomes clear that anthocyanin colourants were used for modelling and shading in the realization of flesh tints, draperies and landscapes. Furthermore, they also appear to have been applied as glazes on layers of gold or silver and served for making the inks that were used to underline rubrics or elements of decoration in illuminated manuscripts. The basic operation is relatively simple and similar from one recipe to another. The petals or the berries are ground and crushed in a mortar in order to produce a foam. The juice is then extracted by filtering the foam through a clean (linen) cloth. The recipes mention several sorts of additional ingredients. For example, alum (potash alum or aluminium sulphate) is mentioned frequently and could have various functions. Its addition can modify the pH and provide aluminium cations that have an impact on the final hue and improve the stability of the colorant. In order to be used in painting and illuminating, anthocyanin colorants were preserved by setting them on a small piece of cloth, mentioned in the recipes as tüchlein or pezette, usually known in English as a ‘clothlet’. 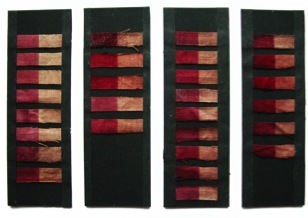 These pieces of cloth were first steeped in the prepared juice until they were saturated by the dye solution. After drying, the pieces of cloth were then wrapped in clean paper and kept between the pages of a book or in a wooden box, and stored in an area free of humidity. To use a stored colorant, the artist would cut off a small piece of the dyed cloth, place it in a shell or horn and pour some gum water or other sort of binding medium, such as egg white, onto it. With the help of Dr Sanyova (KIK-IRPA), I have reconstructed a number of recipes of the so-called ‘Strasbourg tradition’ in the laboratory. 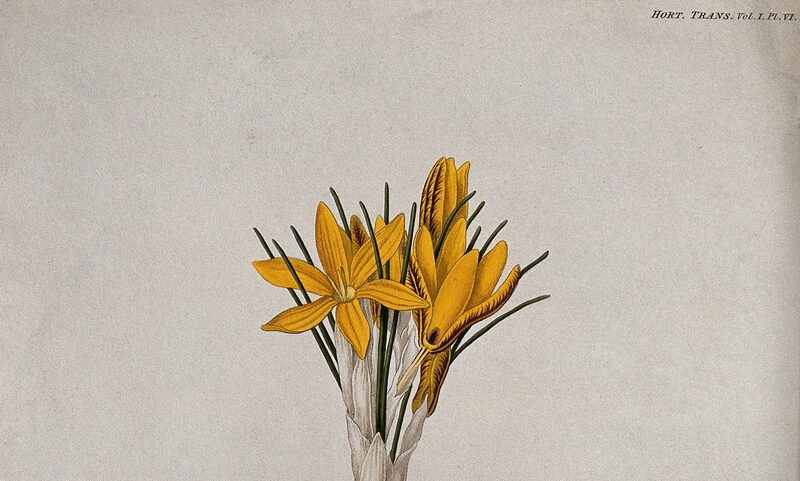 Our purpose was to establish the different ways in which these colourants were prepared and explore how they were used in illumination techniques. We focused on comparing different procedures to make colourants from anthocyanins. The possibility of collating different manuscripts of the same textual tradition allowed us to study the evolution of recipes for the preparation of anthocyanin colourants both through time and through different copies. The numerous recipes recommended the use of different plant species and ingredients in varying quantities. Over the period of several weeks, we prepared series of dummy samples of red and violet tüchlein from the juice of petals of Papaver rhoeas L. After that, the samples were evaluated by visible spectrophotometry and high performance liquid chromatography (HPLC), before and after the artificial ageing process. We found that the different recipes created a number of saturated hues providing artists with various colours. However, interestingly, the products of the different recipes all responded similarly to the artificial ageing process. Anthocyanins are colourants that provide most of the blue, red and violet colours in numerous plants and fruits. Notably : Neven, S., ‘The Strasbourg Family Texts: Originality and Survival. A Survey of Illuminating techniques in Medieval South Germany’, in Revista de Historia da Arte, n° especial, 2011, pp. 65-77; Neven, S., ‘Describing the “elusive”: a new perception of the practices and the resources of illuminators in the North of Europe from the fourteenth to the sixteenth century, in Renaissance Workshop, London, pp. 188-190.